This reproduction print depicts a great vintage poster from World War II. 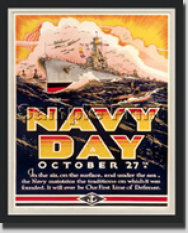 "Navy Day October 27th". In the air, on the surface, and under the sea, the Navy maintains the traditions on which it was founded. It will ever be our first line of defense.